As Palestinian Authority and Fatah Chairman Abbas met with President Trump last week, the two institutions he heads were busy glorifying murderers and planners of suicide bombings and shooting attacks in which 95 people were murdered. "All blessings to our heroic prisoners carrying out the [hunger] strike of dignity: Karim Younes, Marwan Barghouti, Nael Barghouti, Ahmad Sa'adat, Abbas Al-Sayid, Hassan Salameh, Zaid Bassisi, Bassem Al-Khandaqji, Wajdi Joudeh, Maher Younes, Fuad Al-Shubaki, Wael Al-Jaghoub." Hassan Salameh - Serving 46 life sentences for planning suicide bombings that murdered 46. Abbas Al-Sayid - Serving 35 life sentences for planning suicide bombings that murdered 35. Marwan Barghouti - Serving 5 life sentences for planning 3 shooting attacks that murdered murdering 5. Bassem Al-Khandaqji - Serving 3 life sentences for involvement in a suicide bombing that murdered 3. Zaid Bassisi - Serving a life sentence plus an additional 55 years for planning a car bombing that wounded 8. Karim and Maher Younes - Each is serving a 40-year sentence for kidnapping and murdering 1. Nael and Fakhri Barghouti - Each was serving a life sentence for murdering 1. Both were released in the Shalit prisoner exchange deal. Nael Barghouti was rearrested for violating the terms of his release and is serving a life sentence plus an additional 18 years. Wael Al-Jaghoub - Serving a life sentence for establishing PFLP terror cells and carrying out terror attacks. PMW was unable to verify the details of his crimes. Ahmad Sa'adat - Serving a 30 year sentence for heading the PFLP terror organization. Wajdi Joudeh - Serving a 25 year sentence for involvement in a suicide bombing that murdered 4 and wounded 24. 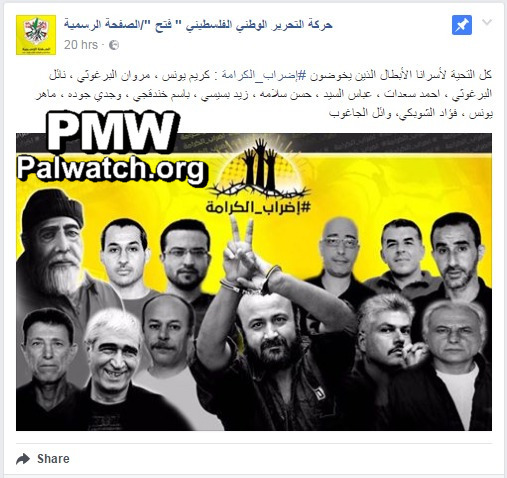 The image posted by Fatah shows the terrorists listed in the post. Above them is a logo showing three hands reaching up through barbed wire. "Jenin District Governor Ibrahim Ramadan and Director of [PLO] Commission of Prisoners and Released Prisoners' Affairs Issa Karake announced that one of the main streets in the city [of Jenin] will be named after veteran prisoner Karim Younes (i.e., terrorist, murdered 1)." Hassan Salameh - Hamas terrorist who is serving 46 life sentences for heading the terror infrastructure that carried out 2 suicide bombings on no. 18 buses in Jerusalem (first attack on Feb. 25, 1996, second attack on March 3, 1996), and the suicide bombing at the Ashkelon Junction hitchhike point (Feb. 25, 1996). 46 people were murdered in the attacks and around 100 were wounded. Abbas Al-Sayid - serving 35 life sentences for planning two suicide bombings, one at a Passover dinner at the Park Hotel in Netanya (30 murdered, March 27, 2002) and another outside a shopping Mall in Netanya (5 murdered, May 18, 2001). Marwan Barghouti - Palestinian terrorist who is serving 5 life sentences for orchestrating three shooting attacks that murdered 5 people: one attack in Jerusalem (June 12, 2001) in which Greek monk Tsibouktsakis Germanus was murdered by terrorist Ismail Radaida and another unidentified terrorist, another attack at a gas station in Givat Zeev near Jerusalem (Jan. 15, 2002) in which Yoela Hen, 45, was murdered by terrorists led by Mohammed Matla, and one shooting and stabbing attack at the Sea Food Market restaurant in Tel Aviv (March 5, 2002) in which Eli Dahan, 53, Yosef Habi, 52, and Police Officer Sergeant-Major Salim Barakat, 33, were murdered by terrorist Ibrahim Hasouna. When arrested by Israel in 2002, Barghouti headed the Tanzim (Fatah terror faction). After he was convicted and imprisoned, he was re-elected member of the Palestinian Authority parliament. On Dec. 4, 2016, he was elected to Fatah's Central Committee. Karim and Maher Younes - Israeli Arab cousins each serving a 40-year sentence for kidnapping and murdering Israeli soldier Avraham Bromberg in 1980 together with his cousin Maher Younes. Originally sentenced to life in prison, but Israeli President Shimon Peres reduced their sentence in 2012. Bassem Al-Khandaqji - member of the Popular Front for the Liberation of Palestine (PFLP). Serving 3 life sentences for his involvement in the suicide bombing at the Tel Aviv Carmel Market on Nov. 1, 2004, in which 3 people were murdered. Nael and Fakhri Barghouti - Palestinian terrorists who murdered an Israeli army officer in January 1978, near Ramallah. Both were sentenced to life but were released in the Shalit prisoner exchange deal in 2011. Nael Barghouti was arrested again in 2014 for violating the terms of his release by offering Hamas to serve as its minister of prisoners' affairs, and is serving a life sentence plus an additional 18 years. Zaid Bassisi - an Islamic Jihad terrorist who planned a car bombing outside a school in Netanya on May 30, 2001, wounding eight people. Bassisi is serving a life sentence and an additional 55 years. Wajdi Joudeh - a senior member of the Democratic Front for the Liberation of Palestine (DFLP) terrorist organization who was involved in the Geha Junction suicide bombing near Tel Aviv on Dec. 26, 2003, in which 4 people were murdered and 24 others were wounded. Joudeh is serving 25 years. Wael Al-Jaghoub - a member of the Popular Front for the Liberation of Palestine (PFLP) terrorist organization who, according to reports in the Arab media, was convicted of establishing PFLP terror cells and carrying out terror attacks. Al-Jaghoub was arrested on May 1, 2001, and is serving a life sentence. PMW was unable to verify the details of his crimes. Headline: "A main street in Jenin is named after Karim Younes"
"Jenin District Governor Ibrahim Ramadan and Director of [PLO] Commission of Prisoners and Released Prisoners' Affairs Issa Karake announced that one of the main streets in the city [of Jenin] will be named after veteran prisoner Karim Younes (i.e., terrorist, murdered 1). This was during a central mass rally organized across from the solidarity tent that was put up as a sign of support for the prisoners waging the battle of dignity and freedom (i.e., a hunger strike by terrorist prisoners that began on April 17, 2017)."